It’s one of those useless explanations that while technically true tells us nothing of value about the situation. The Chinese are never boring when coming back from a Golden Week holiday. 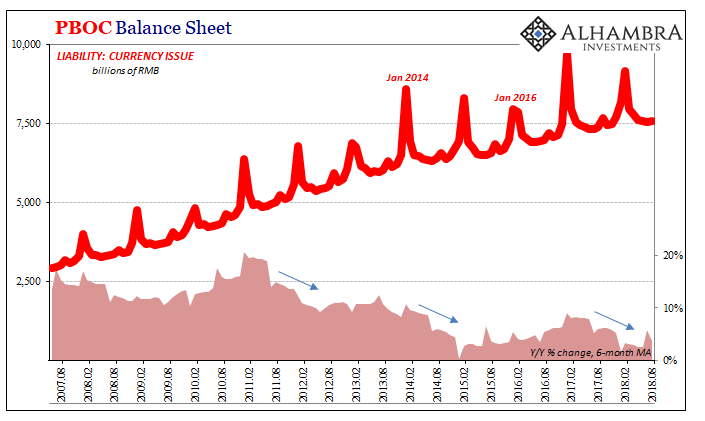 This weekend was no exception, China’s reopening bringing with it the news of yet another cut in that country’s bank reserve requirement ratio (RRR). These things are all related, not that you would know it. 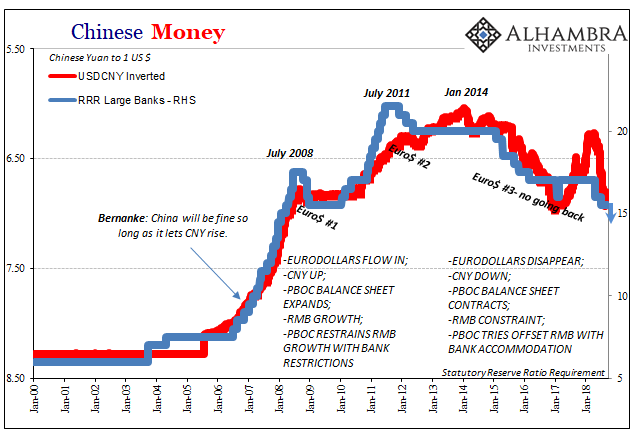 Authorities who “stepped up support” for CNY since August already proposed the basis for the RRR decision. This is all about eurodollar, not Trump’s trade war. 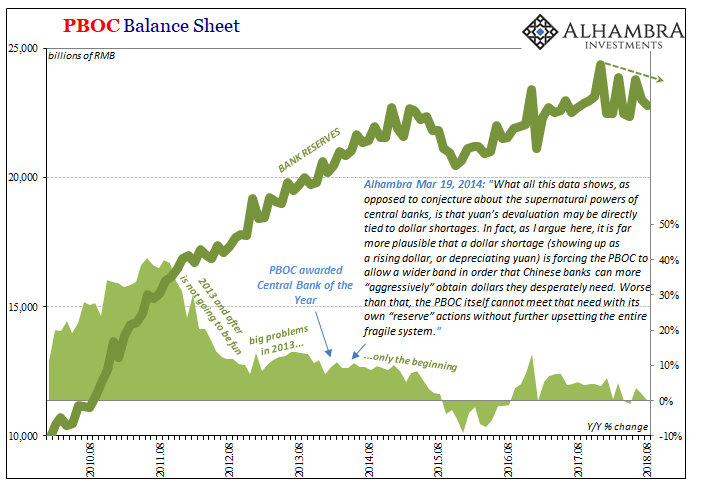 In other words, “stepped up support” for currency means reducing the reserve assets on the PBOC’s balance sheet (or, if you like, selling UST’s). 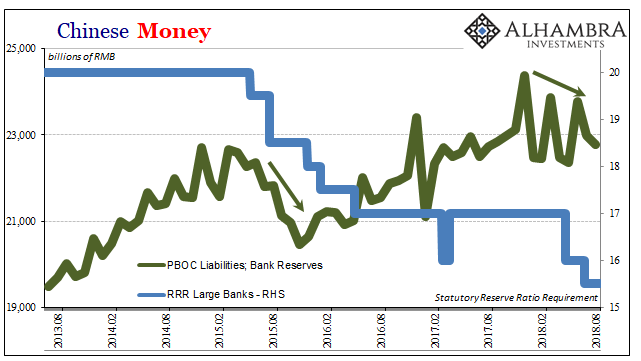 Simple accounting requires either the PBOC to offset those losses with RMB program lending (which tends to be CNY negative), or to further shrink its liability side to match. Guess which one the central bank has chosen the past two years. Chinese officials are trying to get ahead of that public channel monetary deficiency by offsetting it with unlocked private (meaning state-owned) bank reserves. Bank reserve growth will shrink and even contract outright, placing enormous importance on the domestic RMB system’s ability to effective use previously stored reserves in place of what the PBOC won’t be providing. Because the dollars just aren’t flowing to China. They didn’t last year, either, at least not directly (HK) even though CNY rose as if everything was normalizing to globally synchronized growth. Take away the Hong Kong option, what’s left for the Chinese? Or for globally synchronized growth? Like 2015, these RRR cuts are showing us the eurodollar condition. 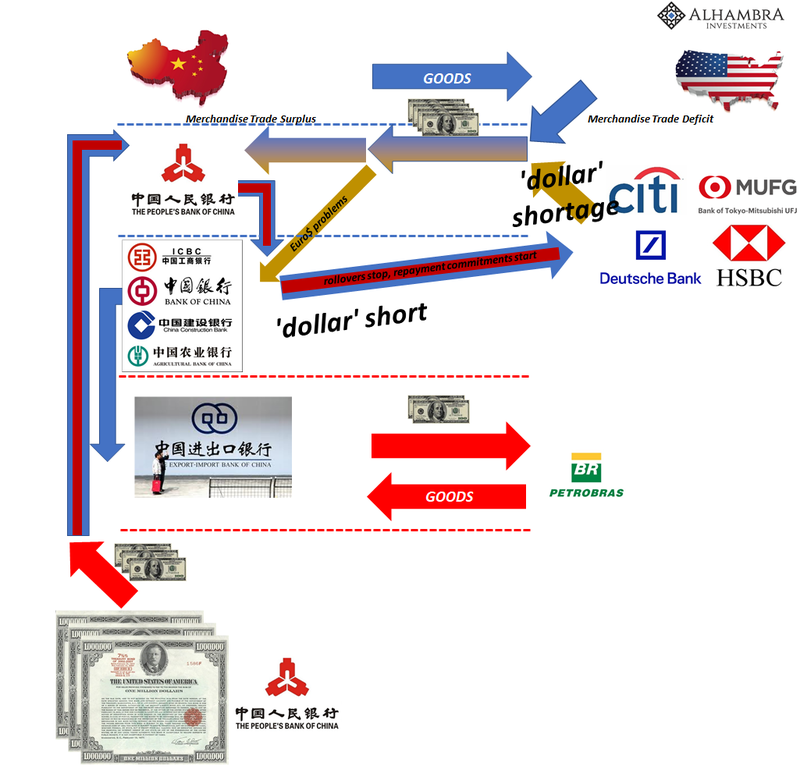 China’s money problems aren’t really Chinese. They are money problems.